MULTI-effects get a bad rep. Sure, back in the dark ages, you were stuck with patchy simulations of classic amps and brittle effects you wouldn’t dream of using. Nowadays, it’s a very different story, with a wealth of impressive do-it-all boxes populating floors across the globe. 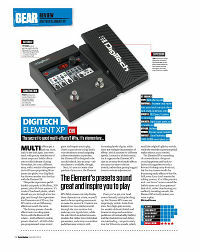 Now DigiTech has thrown another into the fray with the Element XP.